The CST/Berger 5 Meter Aluminum Grade Rod is made from a strong, lightweight aluminum alloy material with sharply defined markings. This rod features Centimeters/E-Metric graduations and a back scale that permits overall height reading at eye level. It is an optimal accessory for achieving accurate readings and effectiveness in challenging surveying and construction leveling conditions. 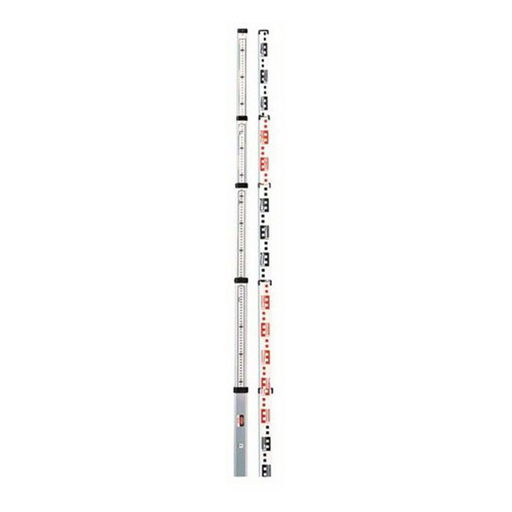 This leveling rod contains 5 sections that extend smoothly when adjusted to its full height of 5 meters. As an added protection feature, it has an anodized finish with special weather resistant and corrosion resistant inks. This grade rod also has wear-resistant polycarbonate buttons that securely lock each section in place while preventing unnecessary slipping. A 90-day limited warranty is included.